Well it’s been nearly 8 months since my visit to Uganda…I can’t believe it’s been that long! Within that time I’ve had some broadcast interviews with local media, delivered talks to different community groups around the region to raise awareness of WaterAid and (and it’s a big ‘and’) signed up to my first ever Great North Run to raise some vital funds. I would like to make it absolutely clear here first of all though, that I am in no way or shape, a runner. In fact, to be quite truthful, until recently you’d be lucky to catch me doing anything more energetic than reaching for my cup of tea and chocolate. Certainly the last time I ever ran anywhere was after the ice cream van when I was a kid. Even then, you could be forgiven for thinking I copied my running style from Friends’ Phoebe on purpose. But visiting Uganda inspired me to buy those trainers, complete that registration and as Nike says, “just do it”! So as it stands at the moment, I’ve got all the gear…but no idea. I’ve been out on a few ‘beginner’ runs and so far, three miles has been my furthest. I can genuinely say I am not looking forward to adding another 10.1 miles to the journey!!! 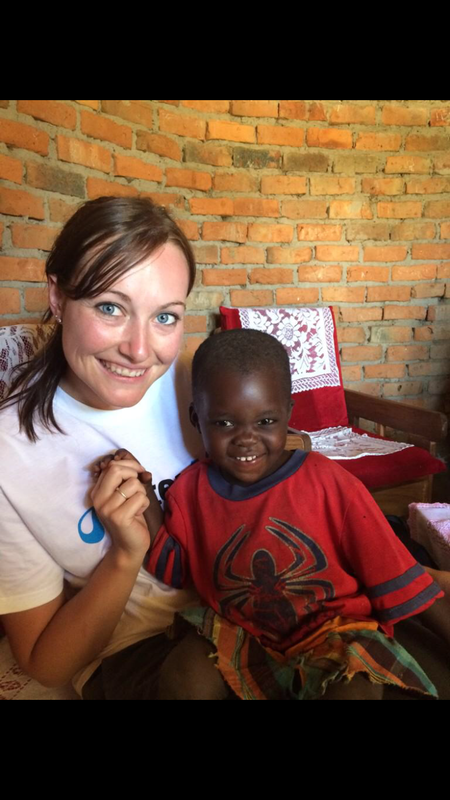 But I’m going to use my memories of the families I met in Uganda to motivate me to put one front in foot of the other because I know that by running the Great North Run in aid of WaterAid, with your help, I can save lives. I’ll never forget Grace and Augustin that I met in Bobul village who’d had their lives completely transformed by WaterAid and I’ll be thinking of their granddaughter Jane (pictured) with every step I take because I know we can help give her a future. I’ll make my way to that finish line, I know I will, it might not be in the best time and my beetroot face and sweaty top might not be the prettiest sight you’ll have ever seen but I can guarantee it will all be worth it! So PLEASE help me give those families access to safe water, hygiene and sanitation! Well, that’s my amazing Ugandan WaterAid adventure over. And to celebrate my return to my comfortable, dust-free (desert-dust free anyway! ), brick-built home this morning, I had a nice hot shower and a cup of tea…and realised just how much I take it all for granted. I didn’t walk 3km in blistering heat for the water for my tea and I’m not risking my life by drinking it. I’m also no longer feeling bogged down by the thought of using a latrine! Before we left Kampala last night, we spent our last day reflecting on our highs and lows (something I’ll write about in my next blog) and visited a craft market. I’m really looking forward to telling everyone about my time in Uganda and raising awareness of the work WaterAid still face if they’re to reach everyone, everywhere with clean water by 2030. For me now though, it’s some good old fashioned English food (no more goat meat) and a much-needed early night! No access to any clean water or toilets, open sewage flowing through the streets, rubbish bags of human excrement strewn everywhere – that’s just a very brief description of life in the Kampala slums where some 700,000 people live. We had a horrendous walk through a pre-WaterAid intervention slum yesterday and I could barely believe that what I was seeing was even real. It had rained heavily the night before and without any proper drainage system, rain water and sewage quickly started to build up and flooded homes. People had to wade through the filthy, disease-infested water to get to their homes, while children splashed and played around in the water, oblivious to the dangers. And when I say homes, these are no more than a rough, makeshift shack, from clay bricks or wood, and a corrugated iron roof. The most horrific thing was the number of plastic bags I saw. This was horrific because they were actually ‘flying toilets’. Some people have no choice but to do their business in a bag and then they just sling it out their home, to land wherever. I had my walking boots on (which are now caked in a dry, orange mud) and I still found walking through the area disgusting but the majority of people didn’t even have any shoes on! The main water source in this slum was from an underground spring. Sounds clean and refreshing right?! But all the sewage saturates through the ground and contaminates the water. There’s a huge risk of cholera, typhoid and dysentery. The post-WaterAid intervention slum we visited after was much better. I met Willy, the proud caretaker of a pre-paid water meter installed in the grounds of his home two years ago. He told me how he’s very happy and that this simple device has changed their lives – they don’t have to drink dirty water anymore and no longer get ill.
People use tokens to come and collect their clean water and there was also a proper drainage system installed in this area too which stopped homes from flooding. There are still improvements to be made here, but it was great to see that WaterAid has already made such a difference. After a tough day, we let our hair down with an amazing African cultural dance show on the night. We even ended the night dancing on the stage, although I noticed when they saw us hopeless Muzungos (white people) trying out some cultural dancing, the music quickly switched to Rihanna! Are we Niley there yet?! Our very long journey back to Kampala from Soroti today was broken up by a special treat. We stopped off along the River Nile to become a tourist for the first time here in Uganda and had a boat ride to the source! As we sailed up the Nile, we saw lots of beautiful birds and even Velvet monkeys. The boat stopped at a little man-made island just before the source marker stone, where we had to get off the boat, kick off our flip flops and get IN the Nile up to our ankles to get to it. It was exciting and quite a funny experience, everyone struggling to wade in over the painful stones! I should point out here that it’s not the same source that Top Gear raced to, or even the one that Joanna Lumley visited, but I’d be in denial (ha) if I didn’t say I’m proud of my trip to the Ugandan source, and who am I to argue where it is! We’re visiting the slums tomorrow so I’m preparing myself to see some difficult things, but detaching myself from reality for a couple of hours today was such good fun! It’s a cr*p situation, (excuse the pun) but it’s very real – 2.5 billion people in the world don’t have access to any safe toilets. We were lucky enough to be in Uganda on World Toilet Day today and to join in a local school’s celebrations, attended by guest of honour, the Ugandan Minister of Health. The purpose of WTD is to raise awareness of the terrible situation and we heard a lot of speeches at the event from other important guests. We also spoke to some of the school children who run a health club to teach their friends about hygiene and sanitation. I’ve seen with my own eyes just how much WaterAid can help communities and guess who will be letting the people of Uganda (those who have TVs anyway…) know about their work? Me! I was interviewed at the event by Ugandan TV this afternoon with a very intense film crew who shoved a LOT of dictaphones and cameras in my hot and sweaty face! No pressure then…! Before our celebrations, we visited a local health clinic where I was appalled to see women and children sleeping on the floor, while chickens ran around the ward and needles littered the ground outside. Overall a very long but very interesting day, and I’ve got some special news for my friends at home…I faced my biggest fear today and used a latrine for the first time! How very fitting for World Toilet Day! Those are the words of Augustin, a “50-something”-year-old family man I met today in Bobul village, who’s life was massively improved two years ago when he was given access to a supply of clean water. Before then he used to walk 3km three times a day to collect water from a dirty pond which frequently made them ill and killed their livestock. As we reached his beautiful home (his compound), his wife, Grace, rushed to greet us like royalty, singing the praises of WaterAid and gratitude for their help in creating a borehole in her community. We helped her sweep the compound, smeared cow dung on her floor as a type of cement (yes, really) and collected her crops from her garden and then she kindly cooked for us. At first, there was slight confusion with what we were about to eat however, over the pronunciation of cow ‘peas’ (or black eyed peas as we know them). I’m not sure that sweet potato and cows p**s would have gone down too well! Aside from such a happy, positive atmosphere, the differences between this family today (post-WaterAid) and the family yesterday (pre-wateraid) were huge. They were educated, healthy, clean and even wealthier. We then visited another school, although this one had access to water, and the children were happier, educated about hygiene and we even helped the girls to make cloth sanitary towels. All these differences are huge and makes you realise just how much of an improvement WaterAid can make – an amazing sight to see! Did a nice cup of tea help soften the blow of that back to work feeling first thing this morning? While you were sat drinking your tea, I was helping 25-year-old Deborah from Ojulai village, with some back-breaking weeding in her garden so her crops could grow – a task she does from 6am to 10am daily. We then swept the compound of her home, took her goats out to graze, dug up some casava (a local root vegetable) peeled it and put it on the fire to roast ready for breakfast, all before Deborah even had any water, let alone a chance to kick back with a freshly brewed cuppa and some toast. While breakfast was cooking, we walked the half a mile to her local well – a murky, dirty stagnant pond that even had a habitant turtle. After filling up a 20 kilogram jerry can of this unsafe water, Deborah lifted it on her head to take back home to begin the cooking and cleaning. Oh, and all of this with a baby wrapped in swaddling on her back and her four-year-old son tagging along behind. It’s unthinkable that this water is what she uses daily for her family, and she makes the trip to the well at least four times a day! Although this part of her life shocked me, Deborah was amazing, self-sufficient and very content in her life! She also found my hopeless weeding and peeling technique hilarious, I told her I’m pretty sure my mam and dad would agree with her! After lunch with Deborah and her many neighbours (who coincidentally arrived the moment the food was being served..) we visited a local school where we chatted to the children and played games with them. We left on a very positive note and had a fantastic experience but I can’t forget the image of Deborah collecting her water from the dirty pond.